When James was little, he asked me 'what made computers work? 'Magic', I answered instantly, because as far as I'm concerned that's the truth. Remember, I learned to write on a slate with a slate pencil, and didn't see a pocket calculator until I was twenty-two, so technologically, I'm a dinosaur. But magic causes many things - computers obviously, and also Chinese food. Chinese food such as that produced by the Ming in Mundaring. We dined, en famile, there recently and were very impressed with the range, variety and subtlety of the dishes. Not the first time we're eaten there, of course, but the first time in a couple of years and almost nothing has changed. The food was wonderful then and it's wonderful now. In a seemingly endless stream, delectable dishes flowed out onto the table in aromatic heaps wafting savoury essences past our twitching noses. The range is vast, as in most Chinese Restaurants, but what is markedly different is the individual flavours of the dishes, so widely disparate in taste, flavour and texture.The Beef Satay ($21.80) was absolutely fantastic, light but savoury, rich but not cloying. In fact, that was the defining character of all the dishes - the elegance of the sauces. And the Chilli, Salt and Pepper Squid as an entrée ($11.80) was just meltingly tender but with wonderful flavour. James chose garlic lamb, not at all his usual, but a very wise serendipitous choice. My own selection of The Ming's Spare Ribs ($21.80) left my portion of the table and shirt front looking like the last reel of a Mack Sennet comedy, but tasted superb. I won't trouble to cover the really wide variety of dishes available, but just say go and try them yourselves. 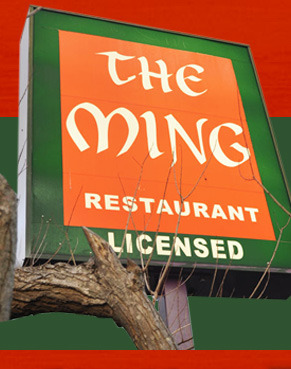 The Ming is licensed with a small but serviceable wine list at not much above bottle shop prices. Dessert is not some-thing that Chinese Restaurants traditionally do very well, but we can recommend the Mango Pudding ($5.80), described, accurately, as 'light and fluffy'. The portions are generous, the staff are polite and swift, the food is excellent and the prices reasonable. This is an outstanding restaurant. However, I wouldn't order the coffee. Besides, Green Tea is both delicious and traditional. This is a great review Douglas, a great read. I liked your opening, it's great when you add a personal touch to an article I love that. And also the restaurant sounds great. I'll have to make the trek there one day and give it a go.